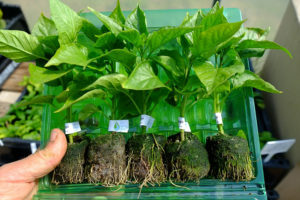 Blister pack containing three chilli plug plants. These will not fit through most letterboxes. 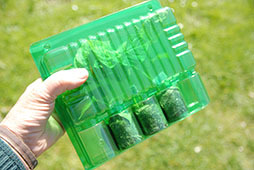 You will receive your plug plants packed in blister packs. Most orders will be sent by first class post; some of the largest orders may be sent by courier. The blister packs will not fit through most letter boxes so please leave a note telling the postman where to leave the package. When you receive your plants remove them from the blister pack immediately. The plants are grown in jiffy-7 pellets, which is a ball of compost held together by a fine net basket. The outside of the pellets may look rather green, or possibly feel a bit slimy. This is natural and is caused by harmless algae growing on the surface. The plug plants will be labelled with a small sticker at the base of their stem. Labelling a sweet pepper plug plant. Labelled Dorset Naga chilli plug plants in a just opened blister pack. 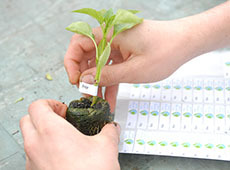 To prevent the root ball from drying out the plants must be potted up immediately. The outer casing of the jiffy-7 pellet does not have to be removed before planting. The roots will grow through the fine netting without any problem. However, the casing is not biodegradable, and if you prefer to remove it just tear it open, then gently pull downwards allowing the roots to be pulled through. Plant the plug deep enough so that when the compost has settled the root ball is not exposed. A chilli plug plant, var. Fairy Lights, grown in a jiffy-7 pellet. Chillies are tender plants that should be raised in a warm environment, such as a conservatory, greenhouse, polytunnel or sunny window sill. If they are kept in a greenhouse or polytunnel be sure the structure is open on sunny days and closed at night to keep the warmth in. Your chilli plants can be grown either in pots or in the ground. Generally the plants will grow larger when given more root space, so plants raised in the ground will be larger than those in pots; and plants in larger pots tend to tend to be bigger than those in smaller pots. 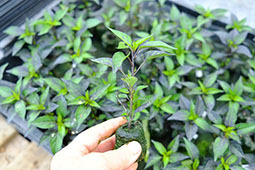 Chilli plants need plenty of light to prevent spindly growth, and should not be overcrowded. They will be bushier if spaced widely. 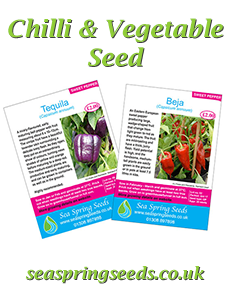 Chilli plants require a well drained soil. If planted in the ground the soil should be deep and well drained. They should be watered regularly, but not overwatered. Where fertility levels are low, a slow release fertiliser should be worked into the soil just before planting. If planted into pots most commercial multipurpose compost will do. As the plants grow and the compost runs out of nutrients your should give a regular applications of all purpose fertilisers, such as ‘Phostrogen’ or ‘Miracle Gro’, or any tomato based fertiliser. Aphids (greenflies) are the pest most likely to be encountered in the home garden. Light infestations can simply be rubbed or washed off the plants with a jet of water. Sprays and bought-in predators should be used for heavier invasions, both of which can be bought from www.defenders.co.uk and www.agralan.co.uk. Most garden centres also sell suitable sprays, but talk to a member of staff to be sure of buying the right product for your needs. Tobacco mosaic virus is a potential problem controlled by banning smoking around the chillies. Gardeners who smoke should wash their hands or wear rubber gloves before handling seeds and plants. Botrytis (grey mould) may appear in late autumn, though by then most of the fruit have been harvested. Many of the chilli varieties we sell will grow into bushy, attractive plants that do well in pots, often without needing any support. These will do equally well on a sunny windowsill in the house as in a conservatory or greenhouse. Other varieties are larger and will need to be potted into the ground or large pots, then given plenty of space and support for the branches. • Given unrestricted root space and ideal growing conditions these plants can grow into very large branching plants – we’ve grown a Dorset Naga over 7ft tall. When grown in small pots they will stay quite small. As a general rule, the bigger the plant the more chillies it will produce. • Flower drop can be a serious problem with, especially with Dorset Naga, and at its worst plants may drop all their flowers and produce no chillies at all. Flower drop happens when the plants are stressed, or more usually when the flowers are not pollinated. The plants ares normally self pollinated, aided by a gentle breeze moving the branches. If the plants are grown where there is no wind/air movement, be sure to have the branches lightly shaken on a regular basis once they start flowering. The superhots will produce extremely hot chillies. Handle the fruit with care, especially when the skin is broken. Do not let children have contact with these chillies.